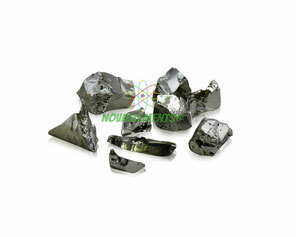 Germanium is a shiny silvery metalloid and a semiconductor. The latter makes it an important material in electronics and solar technology. Germanium is a corrosion-resistant, very brittle and slightly toxic, it doesn't have biological functions. Sometimes organic Germanium compounds are sold as obscure miracle cures. These have no medicinal benefit at all and are rather noxious.